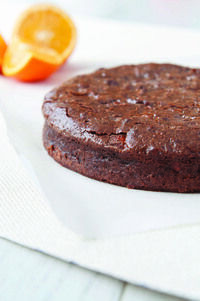 Makes One 20cm (8in) Cake Prep ¹15 Minutes Plus Cooling | Bake ¹35 Minutes Oven 180°C (Fan)/200°C/400°F/Gas Mark 6 Bursting with orange flavour – using a whole orange, skin and all in a recipe may seem a little strange but trust me it works brilliantly! Preheat the oven to 180°C (fan)/200°C/400°F/Gas Mark 6. Grease and line the sides and base of the cake tin. 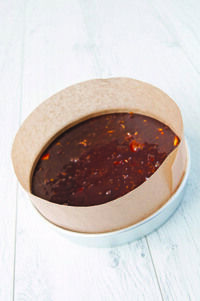 Tip: Using a 49% cocoa solids chocolate is best for this recipe unless you like a darker tasting chocolate. You can use a 70%+ cocoa solids chocolate but make sure it’s a cooks version otherwise it might split when melted in the pan. 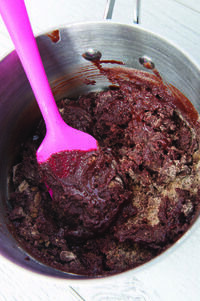 Place the chocolate and butter in a medium pan and heat over a gentle heat, stirring frequently until completely melted. Remove from the heat. Tip Stirring the flour and sugar together before adding them to the chocolate / butter mixture stops you getting lumps of flour in the mixture that can be a monkey to get out! In a separate bowl stir together the flour and sugar. 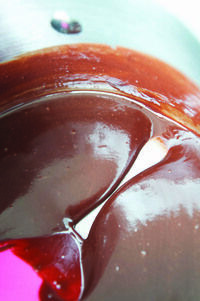 Add this to the chocolate / butter pan and mix well. Add the eggs to the mixture in the pan and beat well until they’re fully combined. Now for the orange. Remove the brown stalky bit and chop it into quarters, then each quarter into half so you have 8 chunks of orange. 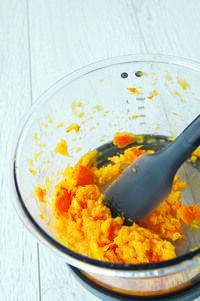 Blitz the pieces in a food processor or with a handheld stick blender until they are the consistency of a chunky marmalade. Add the blitzed orange to the mixture in the pan and stir well. Pour into the tin and bake in the preheated oven for 35 minutes. 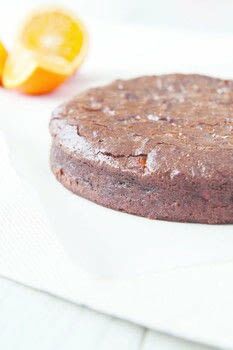 Once baked, allow time to cool the cake fully in the tin before removing and serving.